Enchanting traditions, old as the mountains and seas, are woven seamlessly into Balinese life. 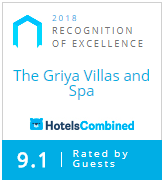 At The Griya Villas and Spa, you can explore these traditions to your heart’s content, without having to rush. That’s why we created this special “long stay” package. So you can take all the time you need to explore and discover, all the while having plenty of downtime too. After all, you’ll have a private villa with your own infinity pool to enjoy for an entire week!